This card has not yet been used in a deck. Join the discussion on our forums! 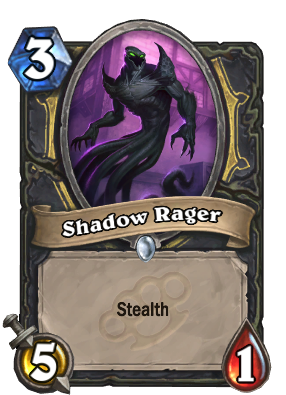 Come discuss Shadow Rager over in our dedicated Shadow Rager discussion topic. Not Elemental because it's a Shade, which is undead. Just realized that it bears a strong resemblance to Shifting Shade. When you don't have enough dust for Patient Assassin. I just got a sixth one from an arena pack today. I keep disenchanting them, but they keep coming back! I got four, and three were in two consecutive packs. No idea why people think this card is so bad. It's actually a REALLY good arena card because it makes your opponent's turn 4 and 5 ridiculously awkward and can force inefficient use from a board clear to remove. It's very similar to Patient Assassin, however the difference is that this can go face. (people use Worgen Infiltrators in normal face rogue. I would run this card in face rogue. It's arguably 3 mana deal 5 face damage and force a reaction. There's also some synergy here with the new give stealth +2 +2 guy, which you can play on curve to make him a whopping 7 3 stealth for 3 mana. Ravenhold Assassin is a 7 5 with stealth for SEVEN mana. And to the people that think that swipe is good vs shadow rager, if my opponent spent his turn 4 solely killing my 3 drop, and used a very important removal card doing so, I would be happy. That goes for all of the other board clears that kill it too. Tl;dr: This card isn't the BEST or OP OP, but this is a pretty decent card, and a great arena card. The best part of this card is that we get a trophy for visiting this page. People are treating the "Meta Defining" votes like they are a joke. But I think this card is legitimately meta defining.